How do I add a rubric to my site? Sakai Community DocumentationSakai 19 User Guide (English) RubricsHow do I add a rubric to my site? Go to the Rubrics tool. Select the Rubrics tool from the Tool Menu of your site. Select Edit Criterion to rename the default criteria. Optionally, you may enter a Criterion Description. Edit the Rating Titles and Points. Select the pencil icon next to the rating item you wish to edit. Enter the Rating Title. This is the performance level, such as "Does not meet expectations," "Meets expectations," or "Exceeds expectations." Optionally, enter the Rating Description. 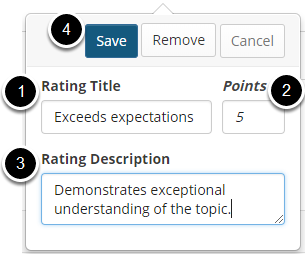 To add another rating level to a criterion, mouse over the line separating one rating from the next and click on the + icon [Add rating to Criterion] to insert a new rating level at that location. Add as many new criteria as needed. Select Add Criterion to add a new row. Or, copy an existing criterion. 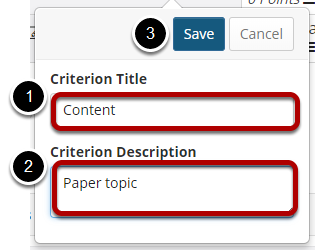 Select the Copy icon [Clone Criterion] to copy an existing criterion. Tip: Sometimes it is easier to copy an existing criterion and edit the copy, than to add a new one. Drag and drop to reorder. You can change the order of both criteria and ratings by clicking on the Reorder icon in each cell and dragging the selected item to its new location. Delete any criteria you don't need. Select the X icon [Remove Criterion] to delete an unnecessary criterion. Select the Remove button when prompted to confirm the deletion. Next: How do I edit a rubric? How do I merge external calendars? What is the Contact Us tool? How do I use the Contact Us tool? What is the External Tool (LTI)? How do I configure the External Tool (LTI) settings? How can instructors customize their Gradebook display? What actions can instructors perform on individual gradebook items? How do instructors view and print individual student grades? How do I exclude a grade for a specific student? How do I set empty cells to zero for a single grade item? How do I change the right to left language direction? How do I edit a rubric? How do I copy a rubric? How do I delete a rubric? How do I share a rubric? How do I stop sharing a rubric? 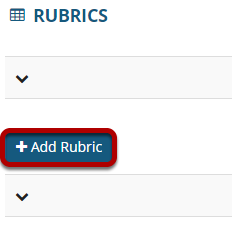 How do I add a rubric to an assignment? How do I add a rubric to a forum topic? How do I add a rubric to an assessment (i.e. test or quiz)? How do I add a rubric to a gradebook item? How do I grade an assignment using a rubric? How do I grade a forum topic using a rubric? How do I grade an assessment (i.e. test or quiz) using a rubric? How do I grade a gradebook item using a rubric? How do I view my rubric feedback as a student? How do I publish/unpublish a syllabus item? How to I add multiple parts to an assessment? How can an instructor retrieve assessments that were saved but not submitted?